My love for art started at a young age, when I would spend hours creating models from fimo and fabric. My first real introduction to clay came when I started Sixth Form College in Cambridge and was given a choice of media in which to specialize. As soon as I touched clay I was hooked. I remember carving into a block of clay to create my first figure, and my brilliant teacher, Neil, saying to me, "Remember, the figure is in there, you just have to discover it". This has always stayed with me. When I started my degree course at the University of Wolverhampton, I spend two years experimenting with a range of techniques. Towards the end of my second year and the duration of my third year, my current style began to evolve and continues to develop to this day. I have a workshop setup at home in Soham where I enjoy creating a range of human and animal figures using my patchwork style of building with clay, and creating new adventures for 'Mister Herbert'. I am proud to announce that a permenant gallery for my work in Soham for customers to visit and view my work is now open. The gallery is open all year round by appointment. Please contact me if you would like to visit. All of my work is unique and individually handcrafted from clay and there are two main ranges for the work I produce. I have been creating my realistic human and animal sculptures for the last 21 years using a mixture of Earthstone clay and porcelain. I construct the pieces hollow using no moulds or interior supports, building with small slabs pieced together almost like a patchwork quilt. These individual pieces can be clearly seen in the finish of the piece giving a lively, distinctive and tactile surface. I enjoy the challenge of creating the fine detail and realistic proportions of the subject, whilst aiming for a feeling that the sculpture, be it human or animal, could suddenly come to life and move. A sense of ‘A moment in time’ captured in each piece. 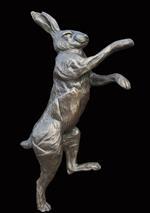 I have recently introduced within this style my first limited edition bronze of a boxing hare. The second area of my work is a lovable character called Mister Herbert. Born from an idea I envisaged in 2010 and named by my 5 year old son. Each unique ceramic Mister Herbert sculpture is handmade with a drop of humor depicting a range of adventures and sayings. Mister Herbert is a stylized figure with gangly limbs and a long face with minimal features; much of the character exudes from the body language and gestures within the positioning of the figure. Mrs. Herbert, friends and animals both mythical and real, often join Mister Herbert. 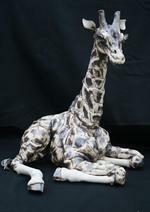 I have great fun thinking up new adventures for Mister Herbert and hope that the pieces bring a smile to the onlooker. Within this range, I also create wall-mounted designs often incorporating a block canvas backdrop and quotations. Mister Herbert started as a small 12cm high figure. This mini Mister Herbert continues his adventures, but is also joined by a 'large' range, which is more detailed and stands approx 45cm tall. I can personalise Mister Herbert to reflect any situation, career, hobby or significant moment. for example, cycling, playing musical instruments, office worker, policeman, nurse, birth or christening, wedding or anniversary. The possibilities are endless! Are you stressed out, at your wits end? A never ending list of jobs, a million emails to send. “Can you just do this?” your boss shouts out, what a pain! No food in the cupboards, no ones made their bed. That’s what my handy pockets and boxes are for! I’ll take away some stresses, there, look, things aren’t so bad. It’s amazing the fresh start a new day can bring. I am looking forward to developing new work in all of my ranges in 2018 and am always happy to hear from you if you would like any further information or would like to discuss any ideas or have an idea for a bespoke design you would like me to create for you. If you have any questions or require any further information, please do not hesitate to contact me at enquiries@sallydunham.co.uk or 07850 286566.